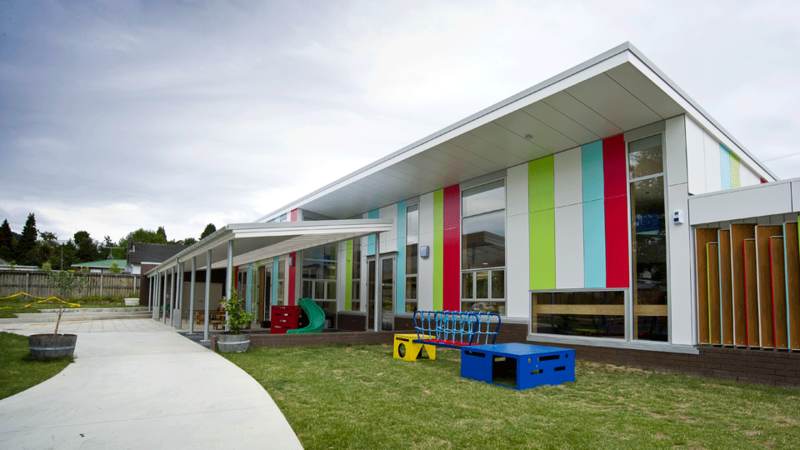 Architecture HDT was engaged by their Client to design a new kindergarten for the Rimutaka Kindergarten Association on a brand-new site of over 3000 sq m in Silverstream. The new purpose built facility was exchanged for RKA’s old 1940’s building a ‘couple of blocks up the road’. Design workshops between client, the kindergarten and AHDT were carried out in order to share and engage in an understanding of what would become realised in built-form. The result: dynamic and engaging spaces totalling 365 square metres ordered around an existing oak tree, which facilitate, animate and enrich the day-to-day activities of the kindergarten. Colourful exterior panels to the eastern wall are purposeful in their intention to enliven what could be a rudimentary fibre-cement clad building front. The outdoor space offers children a combination of surfaces and textures from grass to pavers and rubber matting to provide for different types of activities such as trollies, scooters and ball games. A covered verandah enables outdoor use in wet weather.